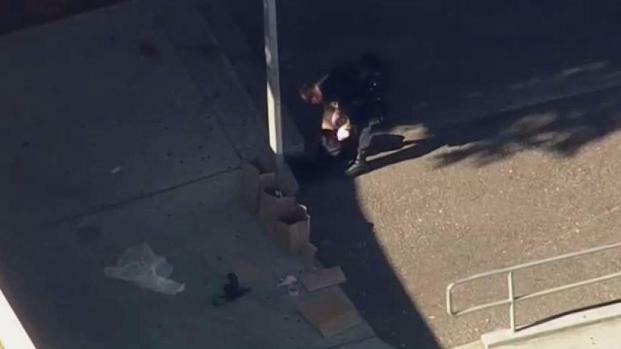 A 14-year-old student suffered non-life threatening injuries after being stabbed on the William C. Overfelt High School campus in San Jose Thursday morning, according to officials. Two teenage suspects — one from a different school — are in custody, police said. Police initially received reports of the stabbing around 9 a.m., Lt. Steve Lagorio said. School staff immediately detained the two suspects, who were then handed off to officers and transported to the police department, Lagorio said. A student at William C. Overfelt High School in San Jose was stabbed on campus Thursday morning, according to officials. Robert Handa reports. The school was put on lockdown and the teenage victim was rushed to an area hospital. Maria Martinez, a student's parent, left work early and headed to the school after her son told her that he was "scared" because his friend had been stabbed behind Overfelt's gym. "I was really scared and nervous because, I mean, as a parent I wouldn't want my son to see something like that or go through anything like that," Martinez said. One student noted that his classmates were "afraid" and "angry" after hearing about the stabbing. He also added that a sense of "tension" could be felt across campus. "It's kind of a scary experience knowing that someone got stabbed here," a student by the name of Ashley said. "It's crazy." Fellow student Edgardo echoed the sentiment. "I don't really feel safe at school anymore because of what happened today," he said. Wendy, another student at the school, was rattled after learning that her friend was the one who was wounded. "I'm still shaking about it," she said. "Right now I kind of don't feel safe being here. It's hard." "How did this happen? How did this kid from a whole different school come with a weapon and nobody was there to help (the victim)?" Martinez said. "How can we trust our kids with these people? It doesn't make any sense." A motive for the stabbing is not known at this time, police say. An investigation is underway.